All it took was a cryptic message in Apple's Aperture forum last month for Aperture upgrade speculation to hit a fevered pitch. The vague post by an Apple senior product manager asked users to “stay tuned” for an upgrade that included support for more cameras “and other exciting new features.” The mystery of whether this was just a point upgrade or a major reworking was put to rest when Apple released Aperture 2.0 on February 12. After spending the last week running Aperture 2.0, it’s safe to say that Apple has made a host of much needed improvements. The new interface is better organized, the program runs more smoothly, and a handful of necessary tool additions should staunch the flow of users who abandoned Aperture during the nearly a year and a half without a major upgrade. A full review is in the works. 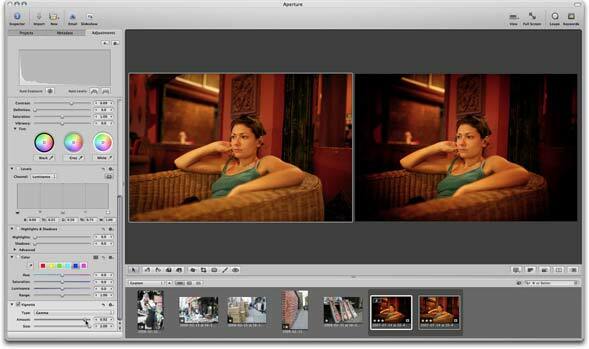 Until the review is ready, here’s a first look at some of Aperture 2.0’s key features. Aperture 2.0 comes with an improved interface that’s more logical and less cluttered than in previous versions. The most obvious change is that the Projects, Metadata, and Adjustments inspectors are now tabbed to give you more space for critical work. Pressing the “W” key lets you cycle through the different inspectors. 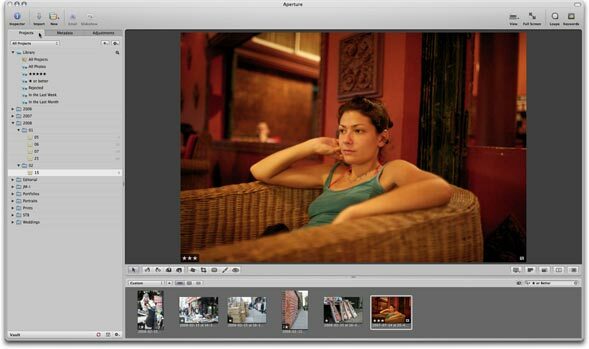 Overall, Aperture 2.0 features a cleaner, easier to use interface. Another great addition to the interface (and seemingly obvious in hindsight) is the ability to double-click a thumbnail in the Browser (or in the Viewer) to switch into Viewer only mode. Double click the image again—this time in the Viewer—to return to Viewer plus Browser mode. It’s a great way to increase editing real estate on-the-fly, and a perfect example of the kind of simple tweaks Apple has put in place to make this version of Aperture a lot easier and more efficient to work with. In Full Screen mode, the heads up display now sports the newly combined Projects, Metadata, and Adjustment inspectors. Unless you're using a Mac Pro, Aperture has a well-deserved reputation for slugishness. There’s no substitute for a powerful hardware setup, but Aperture 2.0 seems to run more smoothly across the board on my 2.16GHz Core 2 Duo iMac with 2GB of RAM. Image adjustments, notably the straighten tool, don’t lag like they used to. I was able to conjure up a momentarily spinning beach after doing some editing, exporting one project, and switching to another to start doing more editing. Tasks like switching projects while the Mac is processing other tasks, editing while exporting, and making many adjustments to many images still slow things down. It's not really reasonable to expect this issue to go away anytime soon because rendering all these changes on the fly on big RAW files is taxing work. Overall, Aperture 2.0 seems to improve on the performance of the previous version; Macworld Lab will test the new version to see just how much of a gain there is. 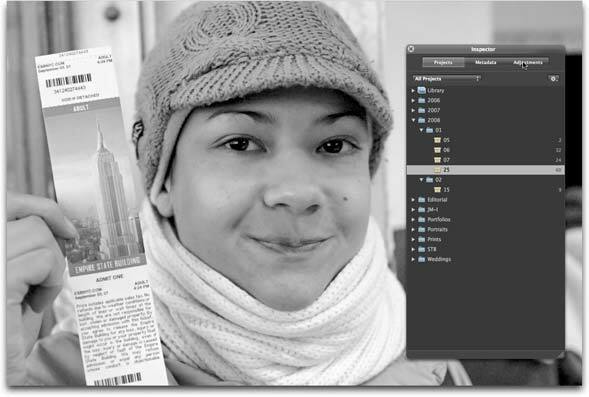 With the click of a button, you enter Aperture’s Quick Preview mode. When in Quick Preview mode, the button is highlighted in yellow so you can instantly see what mode Aperture is in. The new Quick Preview mode also helps speed things along. If your camera records JPEGs along with your RAW files—or you use Aperture to create JPEG previews of your RAW files—Quick View mode lets you browse your images using the JPEG instead of rendering RAW files on the fly. This is a huge time saver if you like to sort and rate your images before editing. You can’t make image adjustments in Quick Preview mode, but toggling between modes is as easy as pressing the “P” key. Background processing is another feature Apple was remiss to leave out in previous versions. It won’t make editing less sluggish, but it will let you keep working while a project exports in the background (albeit slowly). If there is one complaint I’ve heard leveled against Aperture more than any other, it has to do with the lack of certain image adjustment tools that are standard in Adobe Lightroom ( ), Adobe Camera RAW, and programs like Bibble. Finally, Apple has given us a Vignette tool and a bunch of exposure and contrast tools that formerly represented a gaping hole in previous versions. Aperture 2.0 includes a Vignette tool for the first time, allowing users to darken or lighten images to include or remove the effect. I still find it necessary to use Adobe Photoshop CS3 ( ) for heavier editing involving layers or advanced masking—but most users, including professionals, will probably find Aperture suitable for the majority of their post-processing needs. Aperture 2.0 seems like a solid upgrade from Apple—and just in the nick of time. Expect more details and a complete review once we’ve had the chance to put Aperture through it paces.